The Duodenum is the first, widest, rigid and the shortest part of small intestine. It starts from the pylorus and goes upto the duodenojejunal flexure. During the 300 BC, it was hence termed by Herophilus because its length was roughly equivalent to the combined width of 12 fingers. When you think about it, the stomach and the duodenum (the short first part of the small intestine) are exposed to quite a few possibly irritating materials, including acid created by the stomach to help digest food, booze and hot foods like spices. Occasionally, although the stomach and duodenum have a natural defence mechanism that protects against damage the mechanism fails, resulting in disorder. The two most common illnesses that influence the stomach and duodenum are indigestion and peptic ulcer. We currently understand that peptic ulcers (ulcers of the duodenum and the gut) are the result of a bacterium and symptoms are made worse by excessive stomach acid. The value of the Helicobacter pylori bacterium was just understood in the early 1980s and it’s now estimated that about half the world’s people is infected with H. pylori. In most folks there are not any symptoms but others can grow gastritis, which is inflammation of the lining of the gut, peptic ulcer and stomach cancer, a cancer with a fairly lousy prognosis. H. pylori disease can usually be treated successfully with drugs. The term “duodenum” is the Latin corruption of Greek word “do-deka-daktulos” meaning 12 fingers. The duodenum measures about 10 inches (25 cm) in length. It starts at the pylorus, located on the transpyloric plane about 2.5 cm to the right of the median plane and ends at the duodenojejunal junction which is located about 2.5 cm to the left of the median plane and little below the transpyloric plane. The duodenum is retroperitoneal with the exception of the proximal 2.5 cm, that is suspended above by the lesser omentum and below by the greater omentum. The primary purpose of the duodenum is digestion. It gets chyme from the stomach that is blended with bile and pancreatic enzymes here. The duodenum is a C-shaped loop of the small intestine. 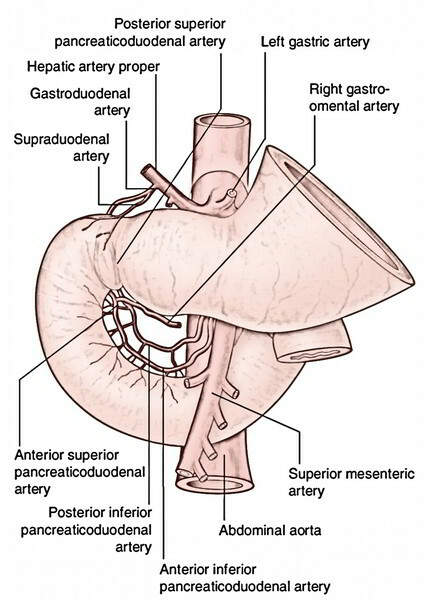 The concavity of the duodenal loop encloses the head of pancreas. The duodenum is situated in the abdominal cavity above the level of the umbilicus opposite to the L1, L2, L3 vertebrae. The duodenum together with the pancreas that is closely related to it is the most deeply located portion of the alimentary tract and the least accessible to physical examination. Superior (first) part, 5 cm (2 inches) long. Descending (2nd) part, 7.5 cm (3 inches) long. Horizontal (third) part, 10 cm (4 inches) long. Ascending (fourth) part, 2.5 cm (1 inch) long. It starts at the pylorus, enters upward, backward, and laterally to the right side of the vertebral column to get to the neck of the gallbladder, where it bends downward (superiorduodenal flexure) to become constant with the 2nd part of the duodenum. It develops from the foregut. It’s freely mobile and distensible. it’s no circular folds in the mucous membrane of its first 2.5 cm- viewed as the duodenal cap in barium meal radiographs. It’s the site for duodenal ulcer. It’s supplied by the branches of coeliac trunk/artery. Only part (first inch of the very first part) that is intraperitoneal for this reason freely movable. Only part supplied by end arteries. Only part that is devoid of circular mucus folds. Anteriorly: Quadrate lobe of the liver and gallbladder. 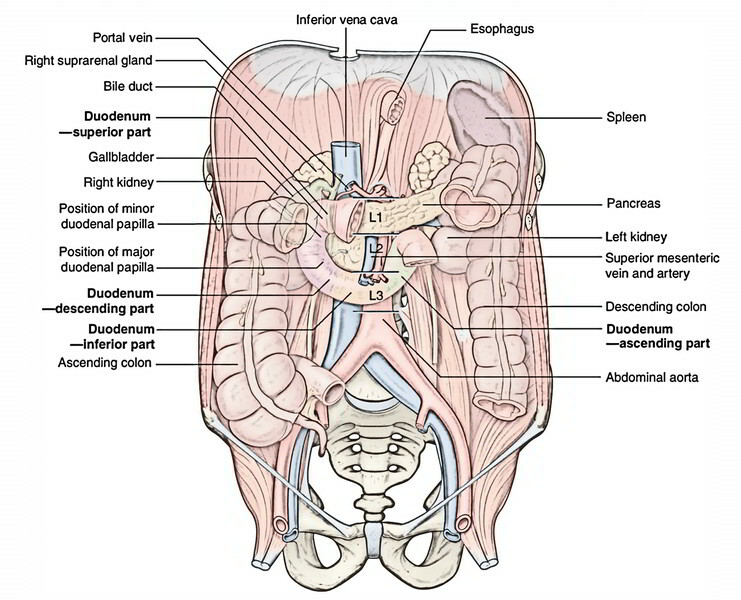 Posteriorly: Portal vein, gastroduodenal artery, and common bile duct (CBD). Superiorly: Epiploic foramen being divided from it by the portal vein and bile duct. Inferiorly: Head and neck of the pancreas. 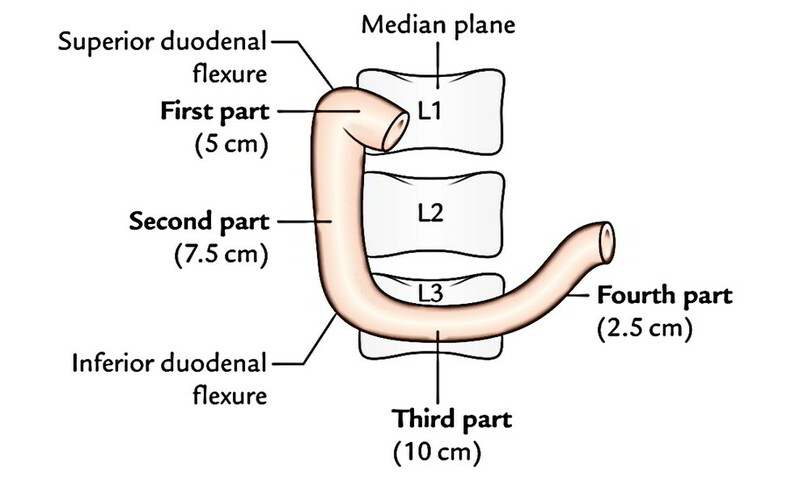 It starts at the superior duodenal flexure, enters downward, in front of the medial part of the right kidney, till the lower border of the L3 vertebra where it bends toward the left (inferior duodenal flexure) to become constant with the third part. Its upper half grows from the foregut and lower half from the midgut. It is located behind the transverse mesocolon. It gets the bile duct, the main and accessory pancreatic ducts. It’s the only part of the intestine supplied by double rows of vasa recta, originating from anterior and posterior pancreaticoduodenal arterial arcades. Anteriorly: Gallbladder and right lobe of the liver, transverse colon, transverse mesocolon (commencement), and coils of the small intestine. Posteriorly: Right kidney and right renal vessels, right edge of the inferior vena cava (IVC), and right psoas major muscle. Medially: Head of the pancreas. Laterally: From below upward, ascending colon, right colic flexure, and right lobe of the liver. It runs horizontally to the left, across the lower part of the body of L3 vertebra, crosses in front of IVC, and after that takes a smooth curve upward to eventually become constant with the ascending part of the duodenum. Anteriorly: Root of the mesentery, superior mesenteric vessels, and coils of the jejunum. Posteriorly: Right psoas major, right ureter, IVC, abdominal aorta, and right gonadal vessels. Superiorly: Head of the pancreas with its uncinate process. Inferiorly: Coils of the jejunum. It runs upward, on or immediately to the left of the abdominal aorta, from the ending of the 3rd part to the upper border of the L2 vertebra where it turns forward (ventrally) to become constant with the jejunum (duodenojejunal flexure). Anteriorly: Transverse colon and transverse mesocolon. Posteriorly: Left psoas major muscle, left sympathetic chain, left gonadal vessels, and inferior mesenteric vein. Superiorly: Body of the pancreas. On to the left: Left kidney and left ureter. On to the right: Upper part of the root of mesentery. Being a part of the small intestine, the mucous membrane of the duodenum presents circular folds (valves of Kerckring), nevertheless they start in the 2nd part and become large and closely set below the level of the major duodenal papilla. Major duodenal papilla: It’s a well marked conical projection on the posteromedial wall and situated 8-10 cm distal to the pylorus. On its peak starts the common hepatopancreatic duct (created by the unification of bile and main pancreatic ducts). Small duodenal papilla: It’s a small conical projection situated 2 cm proximal (and ventral) to the major duodenal papilla. The accessory pancreatic duct starts on its peak. Arch of plica semicircularis: The plica semicircularis creates an arch above the major duodenal papilla like a hood (cf. monk’s hood). Plica longitudinalis: It’s a vertical tortuous fold of the mucous membrane going downward from the major duodenal papilla. 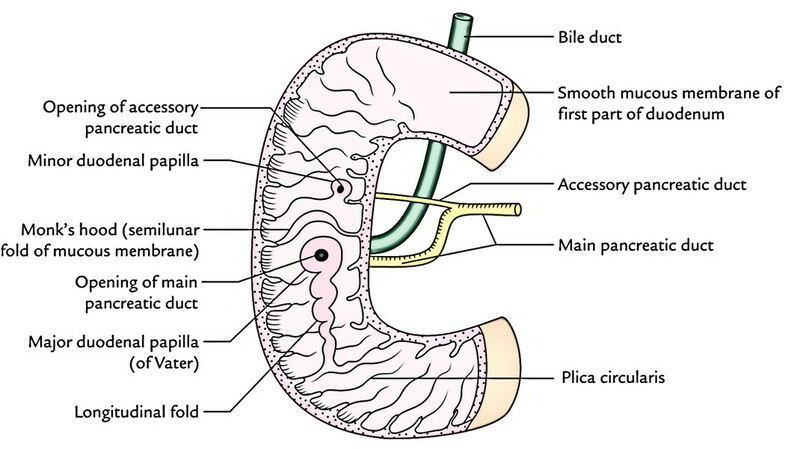 It’s quite essential to comprehend the major duodenal papilla because it’s regularly catheterized under direct vision using a duodenal endoscope and a radiopaque material is filled up in the bile and pancreatic ducts (Endoscopic retrograde cholangiopancreatography). Striated muscle fibres in the upper part. Elastic fibres in the middle part. Non-striated muscle fibres in the lower part. The ligament of Treitz fixes the duodenojejunal flexure and keeps it from being dragged down by the weight of loops of the small intestine. It also acts as a significant milestone in the radiological diagnosis of incomplete rotation or malrotation of the small intestine. Occasionally, the ligament of Treitz may kink the duodenojejunal flexure and might cause partial intestinal obstruction. 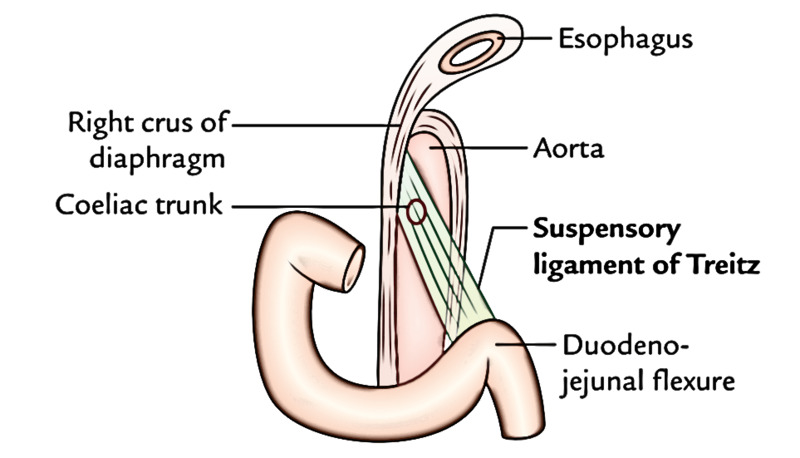 The ligament of Treitz if short the duodenum will be O-shaped, and if long the duodenum will be inverse J-shaped. Therefore, 3 contours of the duodenum are recognized, viz., “C”-, “O”-, and “L” shaped (i.e., inverse J-shaped). In the region of duodenojejunal junction, small pocket like pouches of peritoneum termed duodenal recesses do take place. Superior duodenal recess: It is located to the left upper end of the fourth part of the duodenum, behind the superior duodenojejunal peritoneal fold with its mouth looking downward. 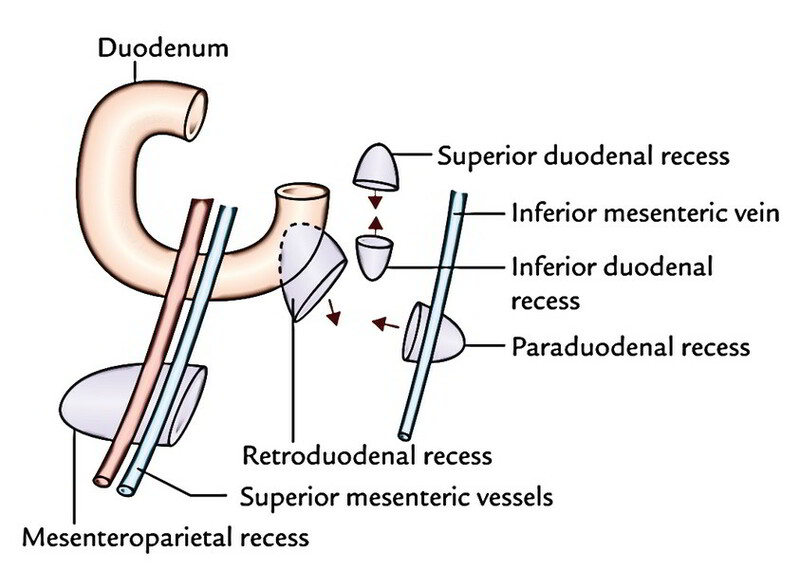 Inferior duodenal recess: It is located a little below the superior recess behind the inferior duodenojejunal peritoneal fold with its orifice looking upward. Paraduodenal recess: It’s the lowest when present. It is located to the left of the fourth part of the duodenum behind the paraduodenal fold of the peritoneum with its orifice facing medially. The paraduodenal fold includes inferior mesenteric vein in its free border edge. Retroduodenal recess: It’s the largest of duodenal recesses, but is infrequently present. If present, it is located behind the 3rd and fourth parts of the duodenum. Its orifice looks downward and to the left. The prevalence of duodenal recesses (vide supra) are: superior duodenal recess 50%, inferior duodenal recess 75%, paraduodenal recess 20%, and retroduodenal recess, occasional. Mesenteroparietal recess: It’s seen only in 1% people. It is located below the duodenum behind the upper part of the mesentery. The superior mesenteric vessels is located in the anterior wall of its opening. Superior pancreaticoduodenal artery, a branch of gastroduodenal artery (a branch of hepatic artery from the coeliac trunk). Inferior pancreaticoduodenal artery, a branch of the superior mesenteric artery. Every of the above 2 arteries divide into anterior and posterior branches. Various branches of superior and inferior pancreaticoduodenal arteries anastomose to create anterior and posterior pancreaticoduodenal arterial arcades. Every anastomotic arterial arcade produces a row of vasa recta. The vasa recta of the anterior arcade supply the anterior surface and those of the posterior arcade furnish the posterior outermost layer of the duodenum. Between the 2 rows of vasa recta is located the head of the pancreas. Supraduodenal artery of “Wilkie”: Normally it’s a branch of the gastroduodenal artery from the coeliac trunk and supplies the anterosuperior and posterosuperior surfaces of the very first part. Retroduodenal branches of the gastroduodenal artery. Leash of branches of the hepatic artery. Branches from the right gastroepiploic artery. Artery from the very first jejunal branch of the superior mesenteric artery: It supplies branches to the fourth part of the duodenum. Arteries C, D, E, and F just supply the very first part of the duodenum. The veins correspond to the arteries but are superficial to them. They drain into the splenic, superior mesenteric, and portal veins. The lymph vessels follow the arteries and the majority of them drain into pancreatic duodenal nodes being located along the inner curve of the duodenum (junction of the pancreas and duodenum). From here the efferents drain into coeliac and superior mesenteric lymph nodes and finally via intestinal lymph trunk into the cisterna chyli. The sympathetic nerves to the duodenum are originated from T6 T9 sections of the spinal cord and parasympathetic nerves from both the vagi via coeliac and superior mesenteric plexuses. From these plexuses, fibres run along the arteries of the duodenum to supply it. The duodenal ulcers generally take place in the very first part of the duodenum because it’s supplied by a series of end arteries and gets the acidic chyme from the stomach. 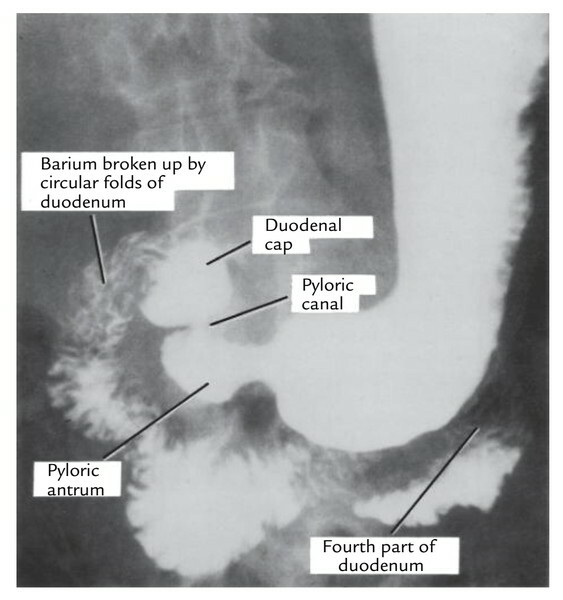 In barium meal X-ray of abdomen, the very first part of the duodenum presents a triangular shadow having a well-demarcated base and not as distinctive apex termed duodenal cap or bulb. When duodenal ulcer is within the very first part, a small fleck of barium is seen filling the ulcer crater and the duodenal cap can be said to be deformed. The 2nd part of the duodenum is most shielded from external injury for the reason that it is located in the paravertebral gutter- a deeper plane in relation to the forward curvature of the vertebral column. The 3rd part of the duodenum is the most susceptible to external injury for the reason that it gets smashed between the vertebral column and the anterior abdominal wall following violence. They may be congenital and just about always take place in the medial wall of the next part of the duodenum. They may be believed to be caused by herniation of the duodenal lining via the gaps in the muscle layer where arteries and ducts pierce the wall. The pain originating from duodenum is poorly localized and referred to the central epigastrium.